In our earlier article, we’ve discussed probability and non-probability sampling, in which we came across types of probability sampling, i.e. Stratified Sampling and Cluster Sampling. In stratified sampling technique, the sample is created out of the random selection of elements from all the strata while in the cluster sampling, all the units of the randomly selected clusters form a sample. In stratified sampling, a two-step process is followed to divide the population into subgroups or strata. As opposed, in cluster sampling initially a partition of study objects is made into mutually exclusive and collectively exhaustive subgroups, known as a cluster. thereafter a random sample of the cluster is chosen, based on simple random sampling. In this article excerpt, you can find all the differences between stratified and cluster sampling, so take a read. Meaning Stratified sampling is one, in which the population is divided into homogeneous segments, and then the sample is randomly taken from the segments. 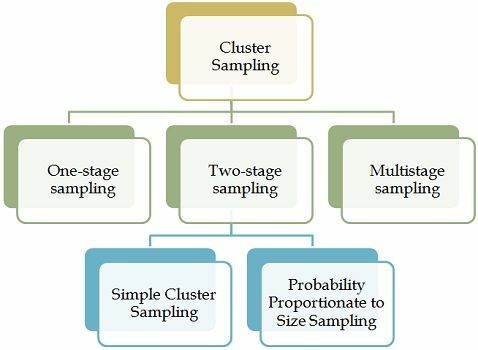 Cluster sampling refers to a sampling method wherein the members of the population are selected at random, from naturally occurring groups called 'cluster'. Sample Randomly selected individuals are taken from all the strata. All the individuals are taken from randomly selected clusters. Objective To increase precision and representation. To reduce cost and improve efficiency. Stratified sampling is a type of probability sampling, in which first of all the population is bifurcated into various mutually exclusive, homogeneous subgroups (strata), after that, a subject is selected randomly from each group (stratum), which are then combined to form a single sample. A stratum is nothing but a homogeneous subset of the population, and when all the stratum are taken together, it is known as strata. Cluster sampling is defined as a sampling technique in which the population is divided into already existing groupings (clusters), and then a sample of the cluster is selected randomly from the population. The term cluster refers to a natural, but heterogeneous, intact grouping of the members of the population. In stratified sampling the individuals are randomly selected from all the strata, to constitute the sample. On the other hand cluster sampling, the sample is formed when all the individuals are taken from randomly selected clusters. In cluster sampling, population elements are selected in aggregates, however, in the case of stratified sampling the population elements are selected individually from each stratum. In stratified sampling, there is homogeneity within the group, whereas in the case of cluster sampling the homogeneity is found between groups. Heterogeneity occurs between groups in stratified sampling. On the contrary, the members of the group are heterogeneous in cluster sampling. When the sampling method adopted by the researcher is stratified, then the categories are imposed by him. In contrast, the categories are already existing groups in cluster sampling. Stratified sampling aims at improving precision and representation. Unlike cluster sampling whose objective is to improve cost effectiveness and operational efficiency. To end up the discussion, we can say that a preferable situation for stratified sampling is when the identicalness within an individual stratum and the strata mean to vary from each other. On the other hand, the standard situation for cluster sampling is when the diversity within clusters and the cluster should not vary from each other. Further, sampling errors can be reduced in stratified sampling if between-group differences among strata are increased, whereas the between-group differences among clusters should be minimised to reduce sampling errors in cluster sampling. how to cite this page ? This is extremely helpful and clear – please publish in text books. Thank you for this resource. Wonderful and concise explanation. Very much appreciated. Cheers. Explained in simple terms specifically for non-statisticians.